On Christmas Eve 2013, off the coast of East Antarctica, an abrupt weather change trapped the Shokalskiy— the ship carrying earth scientist Chris Turney and seventy-one others involved in the Australasian Antarctic Expedition—in a densely packed armada of sea ice, 1400 miles from civilization. With the ship's hull breached and steerage lost, the wind threatened to drive the vessel into the frozen continent, smashing it to pieces. If nearby floating icebergs picked up speed, they could cause a devastating collision, leaving little time to abandon ship and potentially creating an environmental disaster. The forecast offered no relief—a blizzard was headed their way. As Turney chronicles his modern-day ordeal, he revisits famed polar explorer Ernest Shackleton's harrowing Antarctic expedition almost a century prior. His ship, Endurance, was trapped and ultimately lost to the ice, forcing Shackleton and his men to fight for survival on a vast and treacherous icescape for two years. Turney also draws inspiration from Douglas Mawson, whose Antarctic explorations were equally legendary. But for Turney the stakes were even higher— for unlike Shackleton or Mawson, he had his wife and children with him. Yet there was another key difference: Shackleton and Mawson were completely cut off; Turney’s expedition was connected to the outside world through Twitter, YouTube, and Skype. Within hours, the team became the focus of a media storm, and an international rescue effort was launched to reach the stranded ship. But could help arrive in time to avert a tragedy? 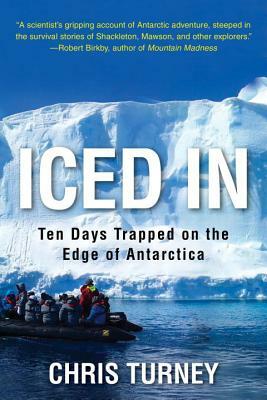 A taut 21st-century survival story, Iced In is also an homage to Shackleton, Mawson, and other scientific explorers who embody the human spirit of adventure, joy in discovery, and will to live. Earth scientist CHRIS TURNEY is the author of 1912: The Year the World Discovered Antarctica; Bones, Rocks and Stars: The Science of When Things Happened; and Ice, Mud and Blood: Lessons from Climates Past. His numerous awards include the Sir Nicholas Shackleton Medal for pioneering research into climate change (2007). He is currently Professor of Climate Change and Earth Science at the University of New South Wales, Australia. Please visit his websites: www.christurney.com and www.intrepidscience.com.